During the Paralympics, Niko and I had several hours to spare between events. Of course those two hours happened to be lunchtime, so we went in search of a restaurant in Westfield Shopping Centre (Stratford). Westfield itself looks like any other new shopping centre and contains all the same shops you’ll find in every Western city. There’s nothing new or interesting, it’s all the same – very dull and boring. 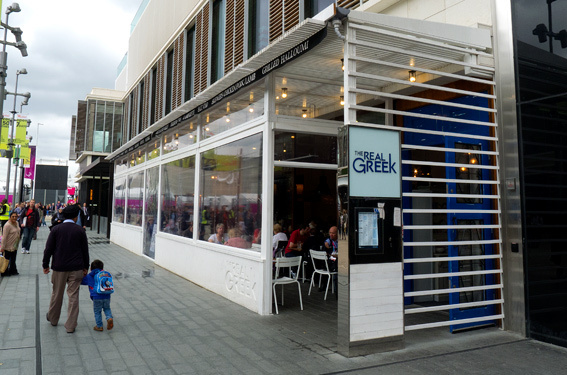 After looking at a few places selling identical steak and burgers we got lucky and spotted The Real Greek. The food looked good and the place was busy. 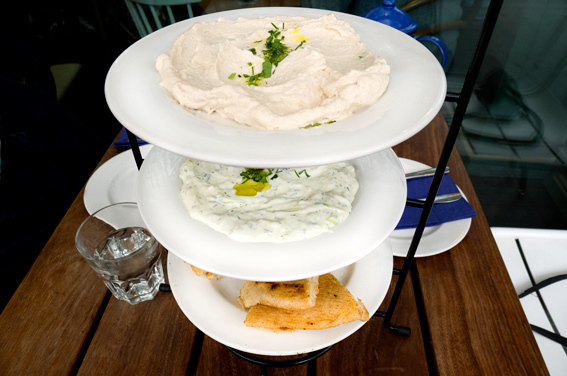 We started with Taramasalata (freshly made daily with undyed cod roe) and Tzatziki (cucumber, dill, garlic and mint in Greek yoghurt). Note the novel cake tier style of food servings. The cynic in me is inclined to think this means they can squeeze in more people on smaller tables. and finally Tiger Prawns with garlic and chilli. I think we visited the right place – even though The Real Greek is a chain of 5 restaurants the service was good and the food was delicious. 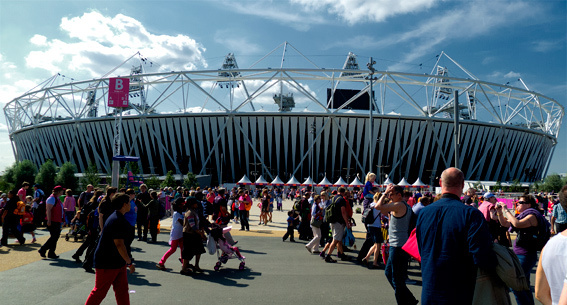 The Paralympics were packed and the largely British crowd cheered for everyone – it was a sight to behold! 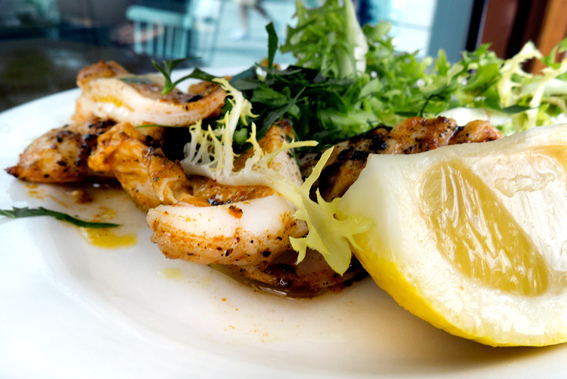 This entry was posted in Eating Out, Fish, Food, Meat, Restaurants and tagged asparagus, kalamari, lamb kefte, octopus, paprika, Paralympics, taramosalata, The Real Greek, tiger prawns, tzatziki. Bookmark the permalink. 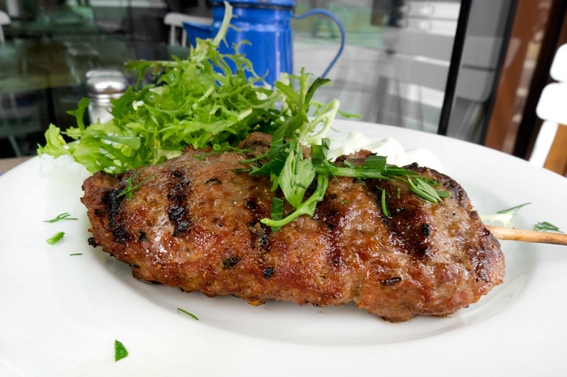 that Kofte looks so juicy … and I am not convinced about your smaller tables theory . Looks like you had six people at yours …was that six or seven dishes you consumed …between two !!! That looks so good. I think I heard about the Real Greek sometime ago from Andy Harris. You should check out his book “Modern Greek” with pictures by William Meppen. I’ll ask around and if I find out about anything specific I’ll let you know. Looks great but I just know I´d have knocked those plates flying! You were so fortunate to attend those games! Which was your favorite event? Only a “foodie” could hunt down such excellent food.. in a mall, no less! 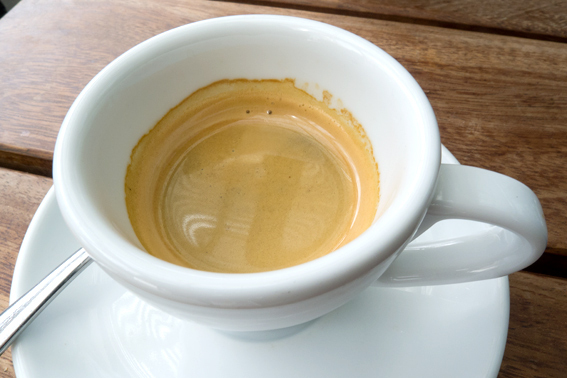 That espresso shot really caught my eye.. along with the rest of the dishes! I like that stacking plates idea! Thanks Barbara – finding good food in a mall is a big challenge! 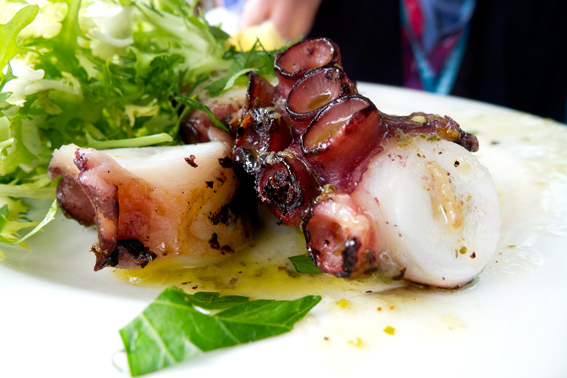 I love restaurant posts and getting inspiration from their dishes! 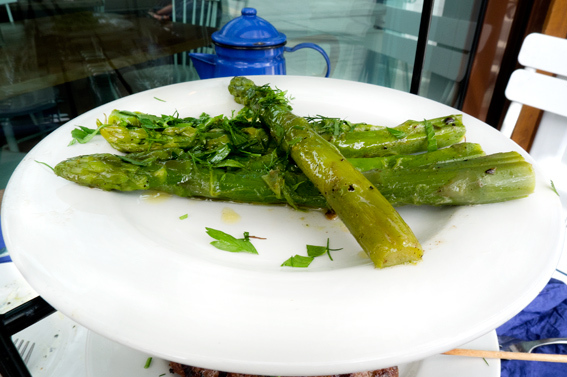 The honey on the grilled asparagus caught my attention, so not thought of that! Plus the presentation on the tiered plates – you’re probably right about space saving for that!! 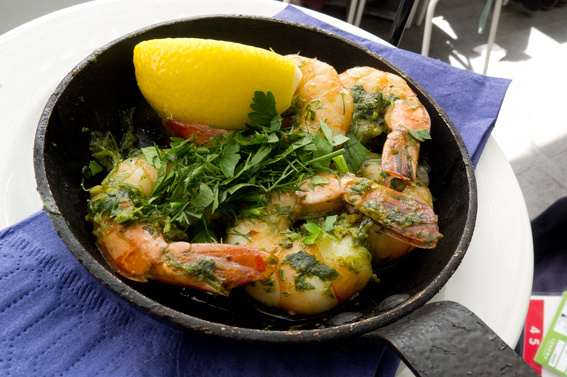 Everything looks amazing, those prawns too!! I’ve never seen an audience like them! Everything I’ve read and watched about the Paralympics described it as a once-in-a-lifetime event. How wonderful that the athletes were treated so well! Sure beats eating a burger. Honey on the grilled asparagus sounds interesting.